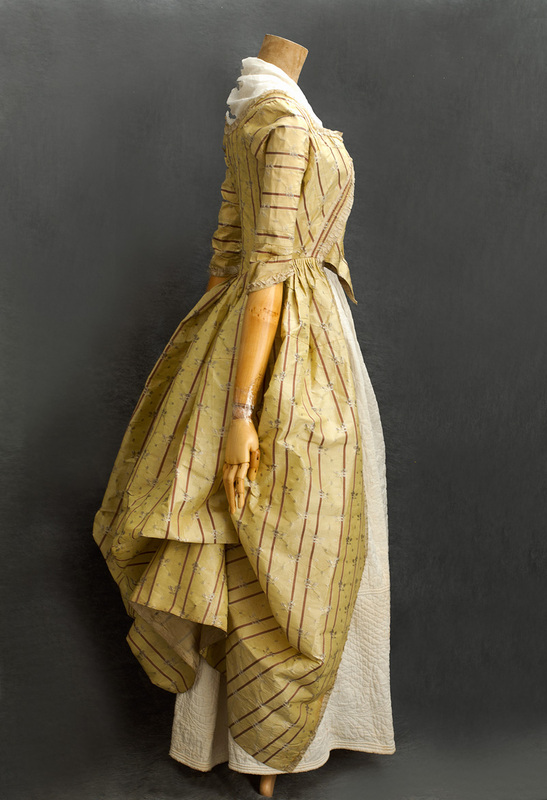 This exquisite silk gown was purchased in France years ago and is probably French. Since then it has resided in a private collection and has not been on the market. 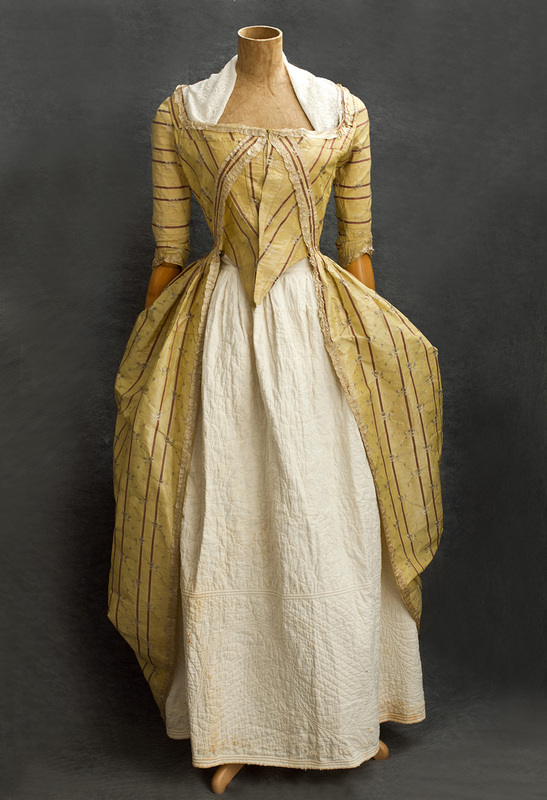 The luxe golden brocade from the Ancien Régime retains an incandescent afterglow even today. 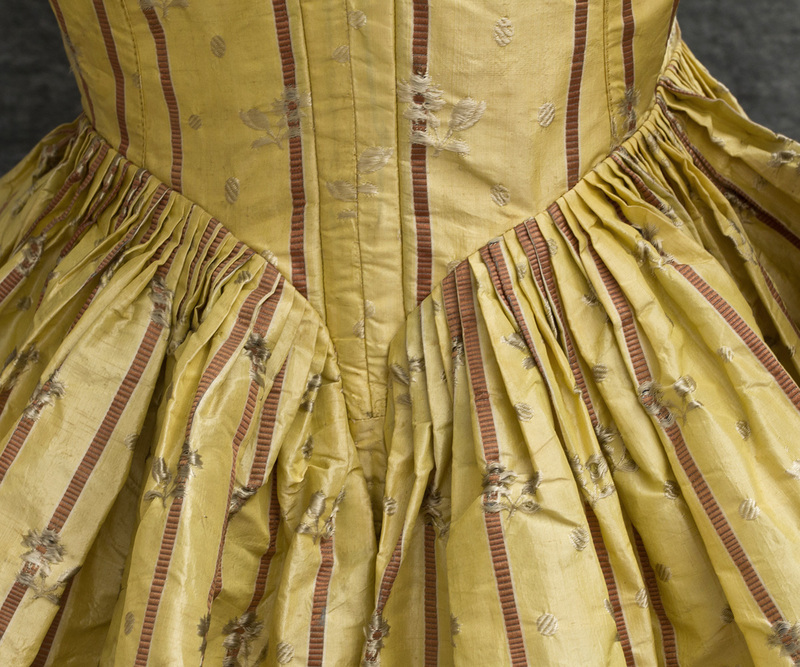 It features compère bodice fronts, common in the late 18th century. 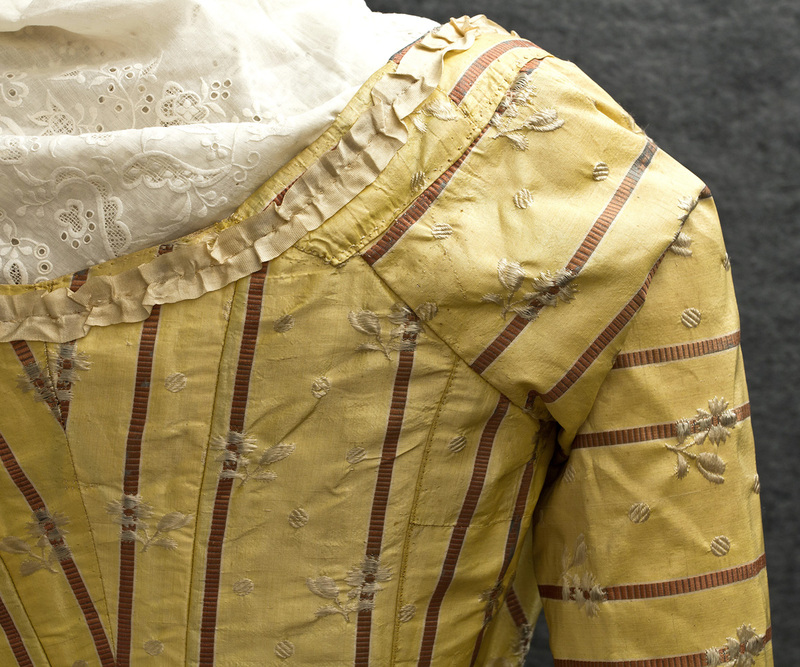 The compères, flaps of matching fabric attached to the robe, formed the bodice front. 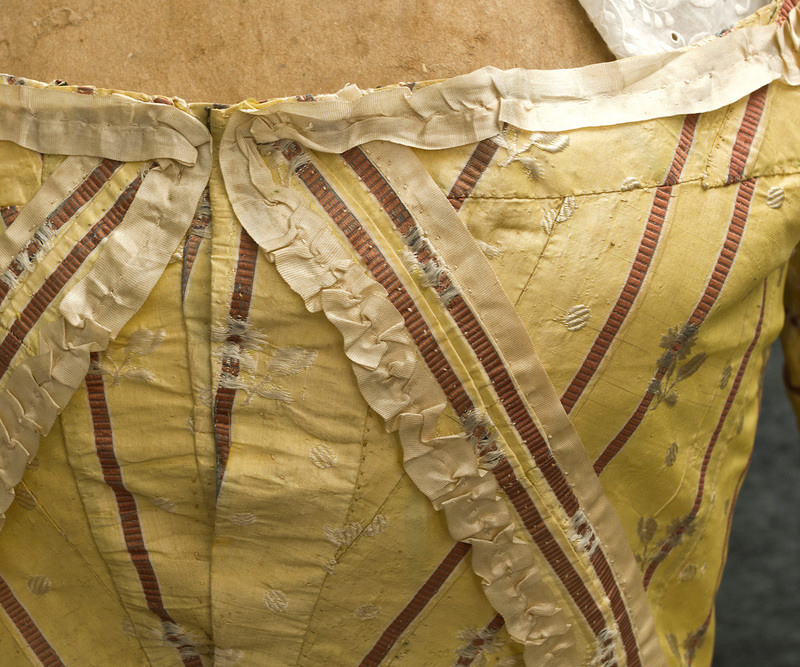 They were more practical than the previous style, in which a separate stomacher was pinned into place when worn. 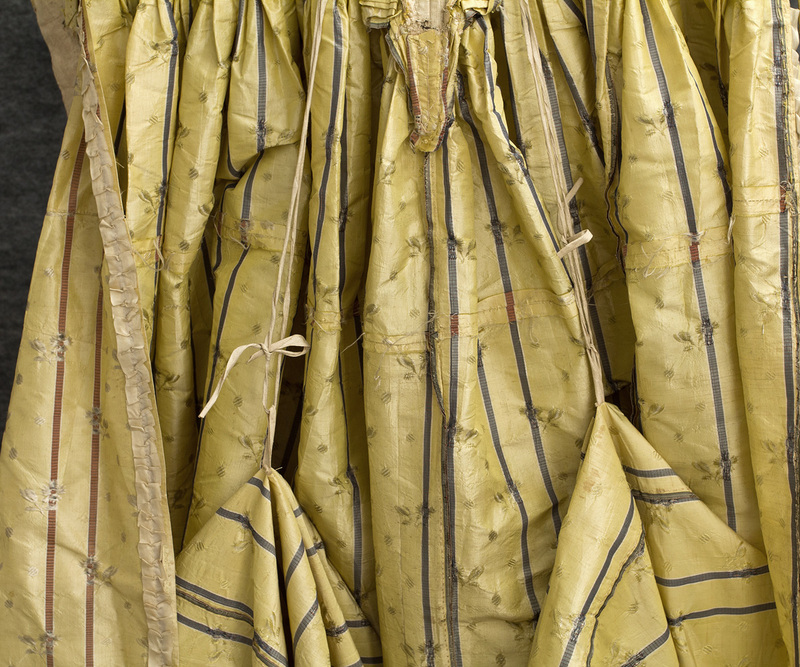 The regal gown can be used as a traditional open robe or else pulled up à la Polonaise with inside cords and loops. The style had a humble origin. Middle class Polish women had a custom of kilting their overskirts up out of the muck of the streets. The Polonaise was a fashionable take on this practice. As usual, it was the French who made international style. 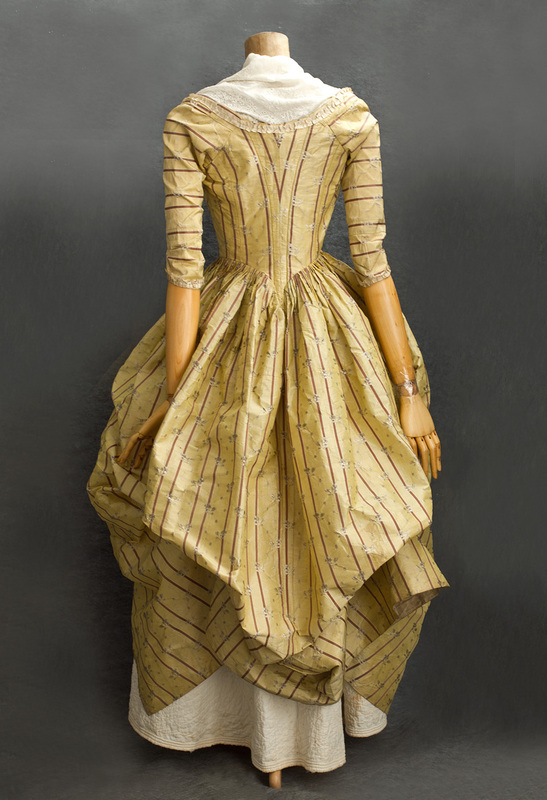 The Polonaise came to the fore because Queen Marie Antoinette wanted to make a safe political (as well as a fashion) statement, showing solidarity with the lower classes by her costume. Elisabeth Vigée-LeBrun painted this famous portrait (1785) of the Queen in happier days, walking in her garden dressed in a Polonaise gown. This was eight years before the young Queen was executed by guillotine on October 16, 1793. The Polonaise style was still seen as late as the 1870s. In Swann's Way, Marcel Proust wrote: "I assigned first place in the order of aesthetic merit and of social grandeur to simplicity when I saw Mme. Swann on foot, in a Polonaise of plain cloth." 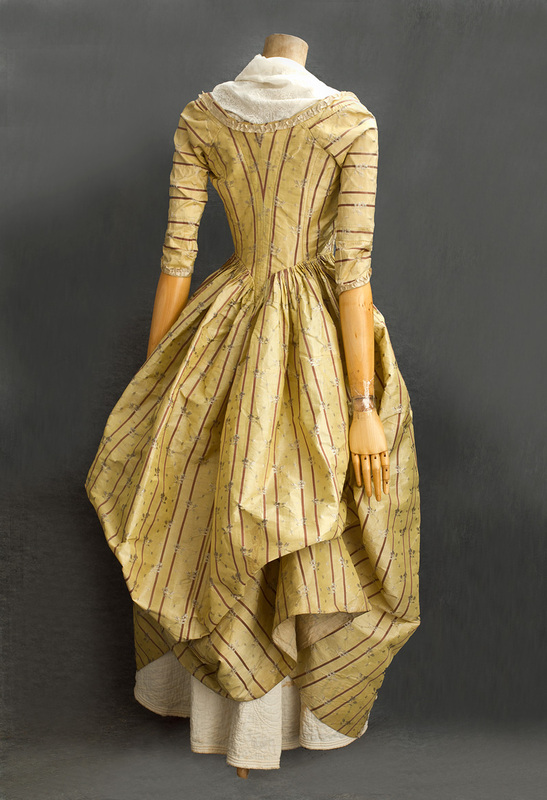 The gown is fashioned from glowing silk taffeta with purple rib weave stripes and small ivory brocaded flowers. The neckline, front, and sleeves are edged with pleated ivory ribbon. The charming compères are decorated with appliqués of cut-out stripes and pleated ribbon. 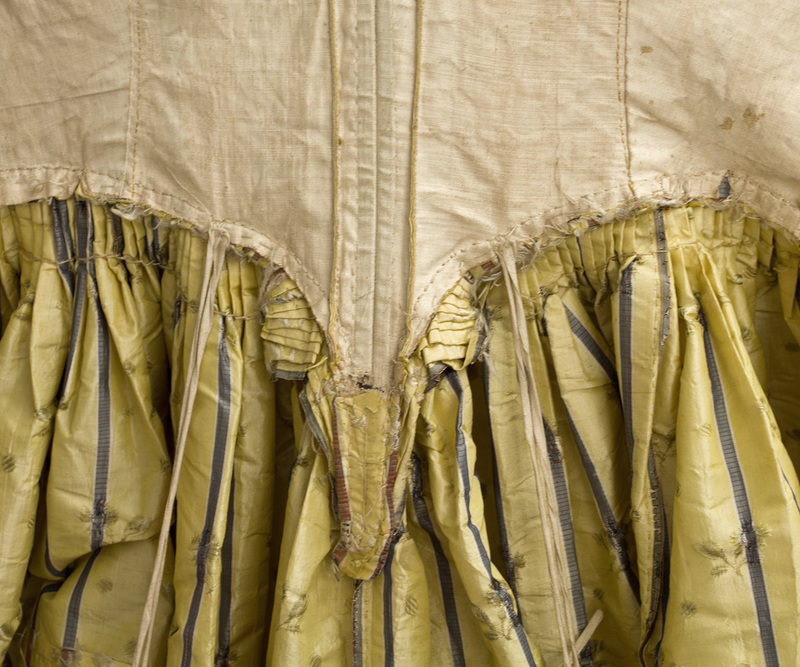 The gown may have had a matching silk petticoat in the 18th century but not necessarily. 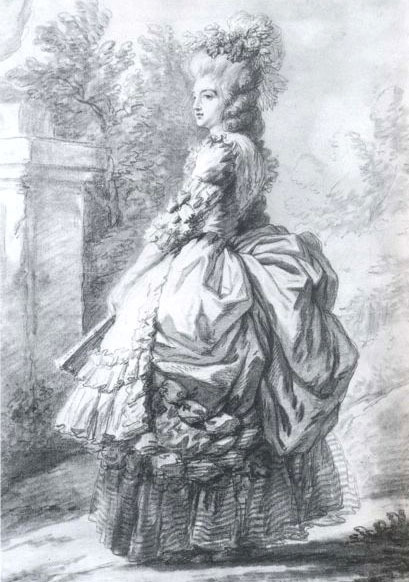 Such gowns were often worn with contrasting petticoats. The quilted petticoat in the pictures is not included. 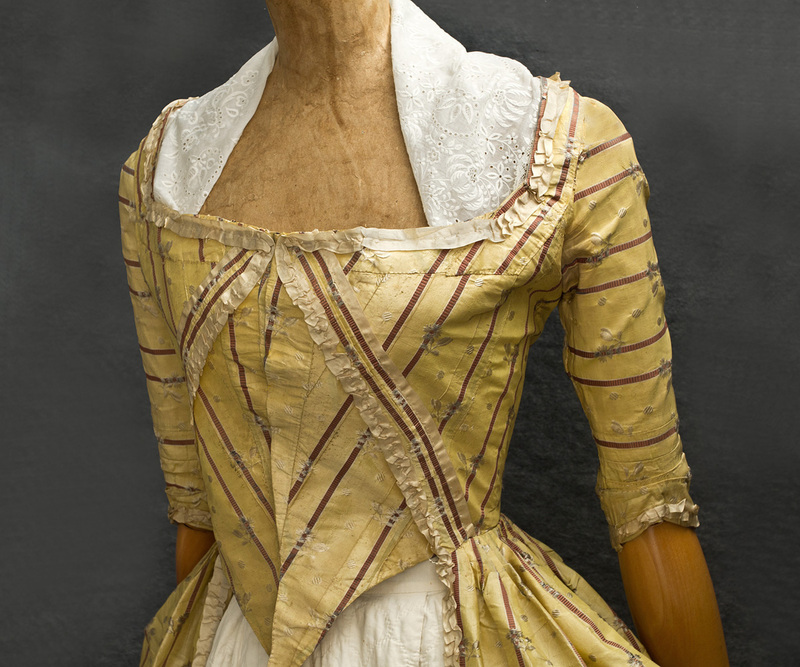 The bodice is lined with ivory linen; the hem is faced with beige silk; and everything is hand stitched. You will not have to pay $6700 to $6900 for a superb open robe like ours with original petticoat, fichu, and engageantes. Indeed, some collectors seek only the robe because they own antique lace accessories to use for display with the robe. The condition is almost excellent. 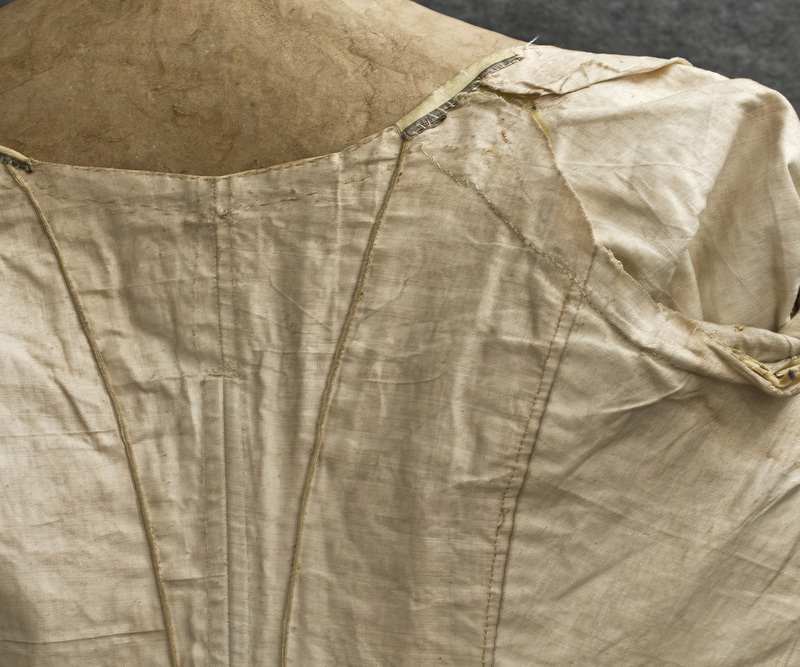 The gown, which just shows gentle wear, appears to be all original, a special treat for the serious collector. It measures: 34" bust, 26" waist, 14 1/2" from shoulder to waist, and 55" from shoulder to hem.